Relay for Life is a global fundraiser for the American Cancer Society. The CoBA Alumni Chapter is putting a team together to participate and help support the good work the ACS does. If you join our team you will set an individual fundraising goal (usually $100), and it's your job to meet your goal; typically by reaching out to friends and family to support your participation in the event (don't worry, there are lots of resources to help you reach your goal). We all work to fundraise during the weeks leading up to the event. On event day each team sets up a campsite around the track. We can bring tents, pop-ups, tables, chairs, games - anything we want! Throughout the 24 hours each team must have a member on the track at all times to signify that cancer never sleeps. Cancer patients don't stop because they're tired, and for one night, neither do we. 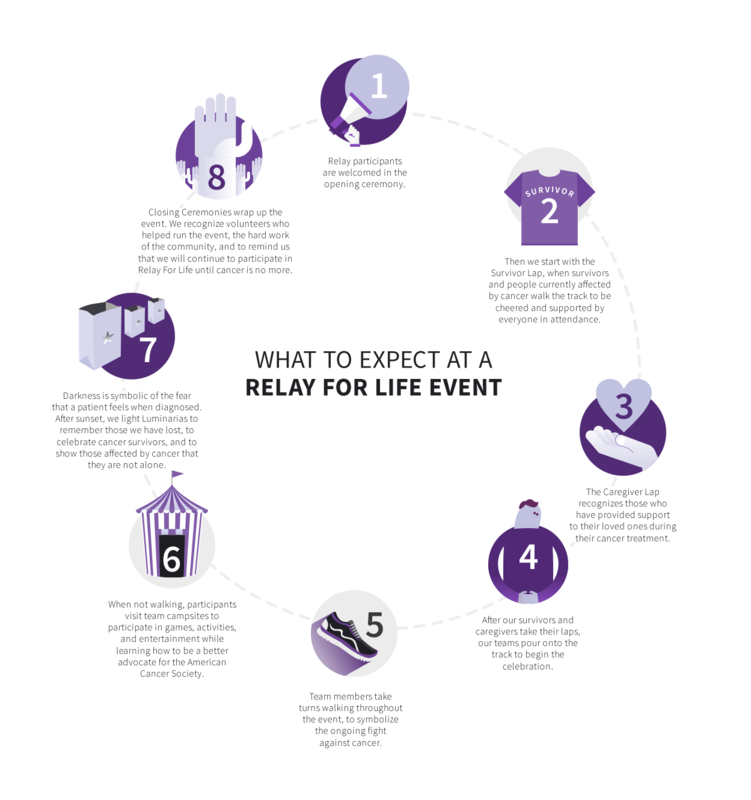 Link: What to Expect at a Relay for Life Event. Ready to join the CoBA Alumni team and help fight cancer? Step 1: Sign Up. Visit the Escondido/San Marcos event page, then click the "Join This Relay" button to sign up. Here is a PDF to help walk you through the sign-up process. Step 2: Fundraise. Reach out to friends and family by writing letters, making social media posts, texting, etc., and ask them to support your fundraising goal. You can get very creative in how you fundraise, and there are A LOT of resources on the Relay for Life website to help you reach your goal. There is even an app now that allows you to take donations on your phone! Step 3: Prepare for Event Day. As a team we will plan our campsite together, as well as activities and games we'll bring. You do not have to stay for the full 24 hours, in fact most teams cover it in shifts. There are planning resources to help you, like this helpful list: What to Bring to Relay. Step 4: Have a Great Time at Relay! Throughout the event there are ceremonies, activities, games, and more! Many teams will sell snacks, crafts, and other small items to continue their fundraising. Throughout the event we celebrate those who have beaten cancer, remember those we've lost, and continue to fight back in the hope that we can one day cure all cancers. Team Meetings: We will have three meetings via conference call. During the calls we will share fundraising tips and plan our team campsite for event day. Follow the Escondido/San Marcos Relay Facebook page. VIDEO, Relay for Life Impact: Where the Money Goes? Explains the ACS programs that benefit from our fundraising efforts. VIDEO, All You Need to Know About Relay. Gives an overview of Relay for Life; how it began, what happens at the event, and how the funds are used. VIDEO, Team Recruitment. Although longer, this video gives a overview of a Relay event from setup to break down.